This article is about the most interesting macaroni penguin facts that are not widespread. The Macaroni Penguin (Eudyptes chrysolophus) belongs to the family of Spheniscidae and is a close relative of Royal Penguin. These types of penguins can be easily distinguished through their unique appearance. Unlike any other species, macaroni penguins have a yellow crest that appears on their head. These birds are primarily found in the Subantarctic and Antarctic Peninsula. Macaroni penguin facts show that these birds frequently travel more than 10,000 km (6,200 miles) while swimming in the Indian Ocean. 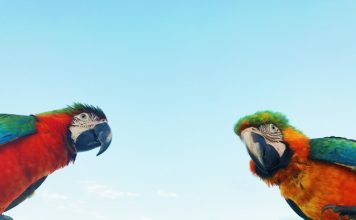 The total population of these birds counts to 18 million around the world. 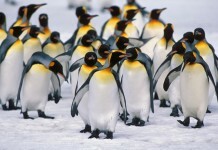 The weight of the macaroni penguins is around 5.5 kg (12 lb). These species are 70 cm (28 inches) long. The females are slightly shorter (with a shorter bill) as compared to males. However, the plumages are almost the same. The average weight of males after incubating is about 3.3 kg (7 lb); before moulting it goes to 6.4 kg (14 lb), whereas after moulting the weight is 3.7 kg (8 lb). The average weight of females is about 3.2 kg (7 lb). The legs and feet are pinkish, and an orange bill coupled with a yellow forehead crest makes them really unique among other penguin species. The females have shorter bill with a length of 5.4 cm (2.1 inches) as against males bill which is 6.1 cm (2.4 inches) long. This yellow crest begins to appear when the penguins reach at 3 years. Macaroni penguins produce vocals similar to that of the crested penguins and since they are often present in large numbers, the place is too much noisy. 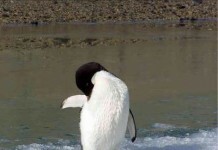 These penguins are highly sociable just like other penguins. Macaroni Penguin facts about its habitat show that these birds are by far the most abundant penguin species worldwide in that there are almost 12 million breeding pairs living today. They are extensively found in South America, Falkland Islands, South Georgia, Kerguelen Islands, Chile, Crozet Islands, Bouvet Islands, Australia, New Zealand, Prince Edward, Orkney Islands, Shetlands, Marion Islands, and Brazil. 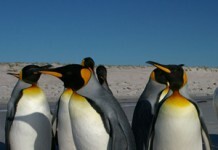 In South Georgia, Macaroni penguins hunt at a distance of 50 km (31 miles) away from the colonies. The distance in Marion Islands is 59 – 303 km (37 – 188 miles). These penguins usually dive 100 metres (330 feet) deep into the water for hunting purposes. They continue to be submerged for about 2 minutes. In a single dive, they are known to catch 5 – 10 amphipods. These kinds of penguins predominantly feed on krill, cephalopods, small fish, and various crustaceans. They can form one of the largest breeding colonies comprising more than 100,000 individuals. These penguin species generally scatter around the ocean for about 6 months after the summer is over. They also eat fish, Antarctic krill, and squid, marbled rockcod, painted notie, lanternfish, exoskeletons of crustaceans. These birds swallow small stones just to ensure the proper digestion process. 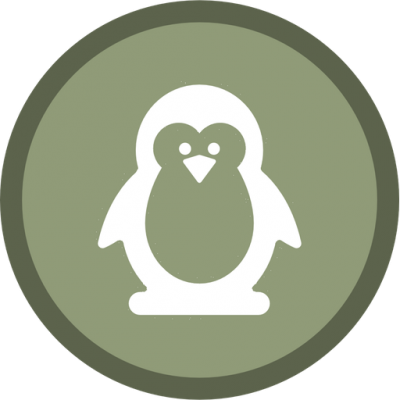 Macaroni Penguin Facts about its predators illustrate that few predators are responsible for the macaroni penguin’s death are killer whales, Fur Seal, leopard seal and other aquatic mammals. 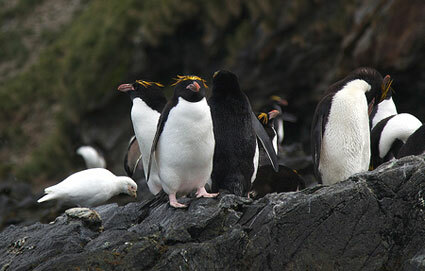 The macaroni penguins eggs are taken by Sheathbill, Kelp Gull, Giant Petrels and Skua. The females are capable to breed after 5 years while males usually begin after 6 years. The breeding period ranges from October to November. The females lay 2 eggs in the breeding season. The weight of the first egg is about 90 – 94 g (3.2 – 3.3 oz) and the second egg weighs around 145 – 155 grams (5.1 – 5.5 oz). Both parents contribute toward incubating eggs after an interval of 10 – 12 days. During the incubation, females do not eat anything for about 42 days. 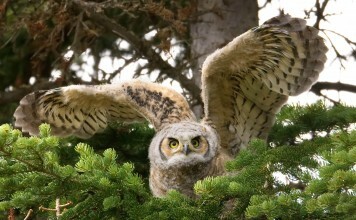 For about 23 – 25 days, the chicks remain with their parents in the nest. They begin to travel toward sea after 60 – 70 days.